Difference between revisions of "Federalist Party"
Photographic reproduction of a print depicting Arthur St.	Clair (1736-1818), who served as the territorial governor of the Northwest Territory from 1788 to 1802. The Federalist Party was one of the first two political parties in United States history. During the administration of President George Washington, Alexander Hamilton was the first Secretary of the Treasury. Hamilton and several of his friends and associates formed the Federalist Party to promote their political ideas. Federalists believed in a strong national government. They said that the Constitution was a "loose" document that did not define all of the powers that the federal government should have. The government had the right to adopt additional powers to fulfill its duties under the Constitution. Hamilton was most concerned with the economy. 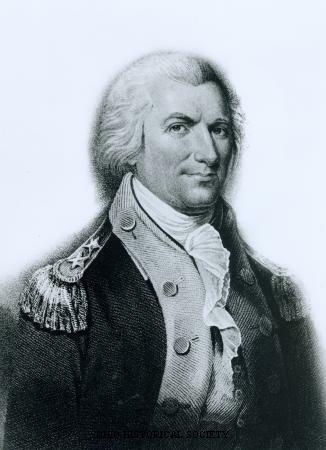 He took many actions that his critics claimed were unconstitutional. Chief among these was the formation of the Bank of the United States. Federalists wanted a diverse economy. The United States at this time was a land of farmers. England and France were quite powerful industrial countries. The Federalists believed America needed to adopt a similar economy. The Bank of the United States would provide loans to businessmen to assist them in industrialization. The bank also was responsible for controlling inflation by limiting the amount of money that the federal government issued. This would create a stable currency for the United States and encourage investment in business. Hamilton believed that only the wealthiest and most educated white men should rule in America. If working-class or even middle-class people came to power, greed might corrupt them. Hamilton and the Federalist Party wanted to model themselves after England, both economically and politically. They wanted to become industrialized and to allow only the most educated and wealthy people to rule. John Adams was the only Federalist President. George Washington never joined a political party, but his decisions while president usually favored the Federalist Party. The Federalist Party ceased to exist at the end of the War of 1812. Some Federalists opposed the war. Many of these men earned their living through trade. The conflict hampered the Federalists' ability to trade with England. In 1814, some Federalists in New England said they might break away from the United States and form their own country unless the American government immediately sought peace. With the signing of the Treaty of Ghent in 1814 and the end of the War of 1812, many Americans viewed the Federalists as traitors. The Federalist Party collapsed, leaving the Democratic-Republican Party as the only political party in the United States until the mid 1820s.